This first part of Really Useful Guitar Stuff will help you understand basic music theory and put it into practice right away, so helping you develop your understanding of harmony in a practical way. Always wanted to unlock the mysteries of "keys" and where chords come from? This pack covers a lot of ground and should take a few months to understand and properly digest all the information - see the contents list below for full details. It s a workbook so you will be doing exercises to check your understanding and then putting it into practice. I really think this is a great place to start for someone who has always been hesitant to get into music theory, it is all practical and will build a good foundation for future study of the guitar. Even this much knowledge will change how you think about the instrument and how to master it. 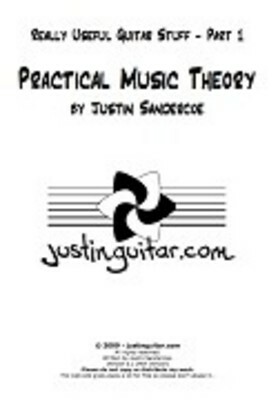 Practical Music Theory guitar;music;practical;theory 141313014 5.99 recohallst Fresh Download Available!